Twas truly a nightmare before Christmas! What would happen if Charles Dickens, Dr. Seuss, and the Brothers Grimm would combine their unparalleled literary social commentary and storytelling abilities for a Christmas movie? The answer is Universal and Legendary Pictures’ Krampus. Based on an actual legend of German origin, Krampus is the antithesis of Santa Claus. Whereas this narrative is not based soley on the legend per se, many of the insidious characters are. A Christmas horror movie is nothing new–recently watched Silent Night Deadly Night with a friend–but a movie of this quality, in terms of production design and plot is, and provides us with a movie that is equal parts a holiday and horror film. In an unconventional way, this movie highlights what Seuss and Dickens wrote about in their timeless tales: Christmas becoming more commercialized and about selfish material gain rather than the spirit of sacrifice, giving, and relationships. Just like Scrooge was so terrified emotionally and physically by the ghosts of Christmas past, present, and yet to come, that he believed in Christmas with all his heart, you may also call your behavior, this holiday season, into question as a result of coming face to face with Krampus. 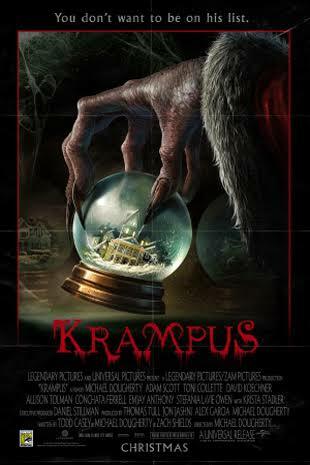 You better watch out, you better not cry, you better not reject Christmas, I’m telling you why, Krampus is coming! For those who lose sight of the true spirit of Christmas and get selfishly wrapped up in their own negativity instead of wrapped up in love, ancient European legend speaks of Krampus (the shadow of Santa Claus) who visits the houses of non-believers who have turned their back on Christmas. Krampus is about a family that, much like yours, is getting together for the holidays. And most likely, just like your extended family, there are members who do not get along with one another–and even resent one another. The Engel family is about to find out the hard way not to lose sight of the magic this time of year. During the course of a day, young Max (Emjay Anthony) falls out of the spirit of Christmas after his dysfunctional family continues to squabble and rejects the spirit of the season. After he rips up his heartfelt letter to Santa in rage, Max unknowingly unleashes the spirit of Krampus and his fractured family must ban together in order to save their very lives from Santa’s sinister shadow. Following a montage of what looks like Walmart or Best Buy on Black Friday juxtaposed against cheerful Christmas songs, the movie opens on a scene from a film adaptation of Charles Dickens’ A Christmas Carol. Krampus establishes the subtext of this unconventional Christmas movie up front. It is no surprise that there are many self-reflexive elements in this movie; but, it is surprising how well-executed the plot of this film is. Despite the fact the trailer was quite good, I had fairly low expectations for this film because usually Christmas horror movies are just campy. However, there are naturally exceptions to that trend in films like Tim Burton’s Nightmare Before Christmas or A Christmas Carol. A Christmas Carol? Yes. For those who have read the masterpiece, you know that it is a very macabre story in many respects. It had to be. How else was Scrooge going to be so scared for his life and the future if he wasn’t terrified and truly desire to embrace the spirit of the holidays? Maybe A Christmas Carol film adaptations are not traditional horror films, but they certainly contain many horror elements. Krampus takes the idea of developing a horror film out of Christmas to a whole new level. One that is billed as a horror comedy, but it is really more of a traditional horror film. Horror films, like other genres, often follow the “order–>disorder–>order again” plot structure, but there are times in which it is more like: “order–>disorder–>order–>disorder again.” As I have written in my own research and previously on my blog, horror is concerned with warping that which is otherwise safe or familiar in order to comment on a societal problem or trend. Not always, but many times horror films can enable us to look at gender roles, sexuality, racism, economic, and technological sociological factors in a different light either positively or negatively. That has always been the case since the days of Nosferatu to Psycho to Alien to Silence of the Lambs. Horror films usually have substantial twists or reveals; and one in Krampus definitely caught me by surprise. Just when you think everything is going to be fine and follow a more cliche path, you are blindsided! Although the dialog is typically not strong in a horror film, Krampus contains well-written dialog that is both funny and fitting. Regarding the dark-comedic content in the plot, the comedy is more subtle than prominent; although, watching a jack-in-the-box devour a small child has a degree of demented humor in it. Like with Universal and Legendary’s Crimson Peak, German expressionism is presented quite well in Krampus. In my previous writings, I have highlighted that German expressionism is at the root of the American horror film. There is even an animated sequence integrated very well into the diegesis that contains copious examples of German expressionism with elongated buildings, gothic design influence, and the use of natural and artistic shadows. Not as pronounced, the rest of the movie clearly shows that German expressionism was included in the designs of the creatures, Krampus himself, and in the neighborhood. By using shadows and warping the perception of landscape and residential engineering, the otherwise upper-middleclass neighborhood looks like it jumped right out of Nosferatu. Whereas this may be an unconventional Christmas movie, it still very much embodies the holiday season. We are reminded to never lose sight of the spirit of sacrifice, tolerance, giving, and relationships. Furthermore, this movie is instrumental in encouraging us to not allow the holidays to become a mechanical reaction, but to truly allow the magic of Christmas to aid us in bringing cheer to those around us. If the lyrics “he sees you when you’re sleeping, he knows when you’re awake, he know if you’ve been bad or good, so be good for goodness sake” were not creepy enough as it is, then knowing that the shadow of Santa will be unleashed and not come to give, but to collect, if you turn your back on Christmas, then they just became even more terrifying. Universal has proven for more than 100 years that they are the king of horror; and this newest addition to both horror and Christmas movies continues that tradition of a commitment to being the subject of our nightmares.